Beyond Infinity Film: Beyond Infinity Film Celebrates: The Artist! I may have already reviewed the film back at the start of January (my first ever review no less! 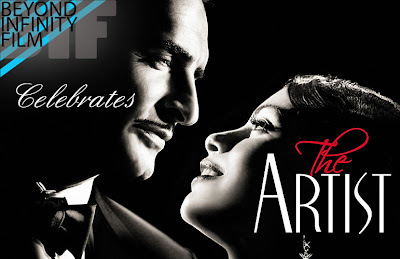 ), but after its overwhelming and much deserved successes all award ceremonies including the big two; The BAFTAs and The Oscars, I feel it's only right to give some more attention to what is a truly remarkable film - The Artist. Back at the start of January when I first saw and reviewed The Artist, very few people had heard about the film, and it's staggered release meant that many of those who had couldn't see it anyway. Now however is a very different picture. Riding off the back of its many award successes, The Artist is now playing in many cinemas up and down the country, and last week my local independent cinema (the fantastic Gulbenkian cinema in Canterbury) showed it all week, with sell out showings on a nightly basis! I decided this week to go and see the film again, and it has to be said that for me, this second viewing was a very special moment; in fact I'd probably go as far as to say the best cinema experience that I've ever had! Whilst the first time I saw it, there were only 5 to 7 people in the entire cinema, here the screening was sold-out. The handful of people in the cheap chain multiplex cinema who sat munching loud crisps in my ear throughout the film had been replaced by a large audience of cinema goers who all were enthralled by the magic of the film. And there I was - right in the audience scenes from the film itself! I spoke fondly of these moments in my review saying how I wish that cinema was a special today as it was back then, as seen in a number of the films scenes, and in a rare moment in modern cinema I was there. This for me was a truly amazing moment, with the entire audience laughing along and enjoying the film together; it was a true experience elevating the film up to something special. Back in 2009 with the release of Avatar, millions of people around the world flooded to cinemas to see what was an event film; The Artist is like this too, except the event for this is far superior than Avatar's gimmicky CGI/3D effects - it is the heart and soul of the film that by taking us back to its roots reminds us why we love cinema and why it is so special to us all. The Artist truly is a cinematic triumph on so many levels, and I am so proud to see it receive all of the attention and awards that it so rightfully deserves. I'd like to personally congratulate every single person involved in creating this film, especially the incredible works of director and screenwriter Michel Hazanavicius, and the wonderful lead performances of Jean Dujardin and Bérénice Bejo who drive forward the story and bring it to life - it's so rare to see a film as special as this, and so exciting to also see what is technically an almost silent French film in the 4:3 format and black and white achieving such success today! The Artist is still showing in cinemas across the UK - so catch it whilst you still can! Have you seen The Artist? What did you think? Leave your comments below!